A couple of photos of a 69 mm male Dynastes tityus that emerged yesterday. This is the largest example of this species that I've ever produced. The largest specimen that I've ever heard of however, was 70.75 mm. I've maintained my tityus culture continuously since 2002, all descended from just one original pair, and they've shown no signs of problems despite being repeatedly inbred for 16 years, with no new genetic lines introduced. The male in the photos is one of several of comparable size that I've had emerge over the past few weeks. They took 2 years to go from egg to adult, and were reared on fermented oak sawdust. 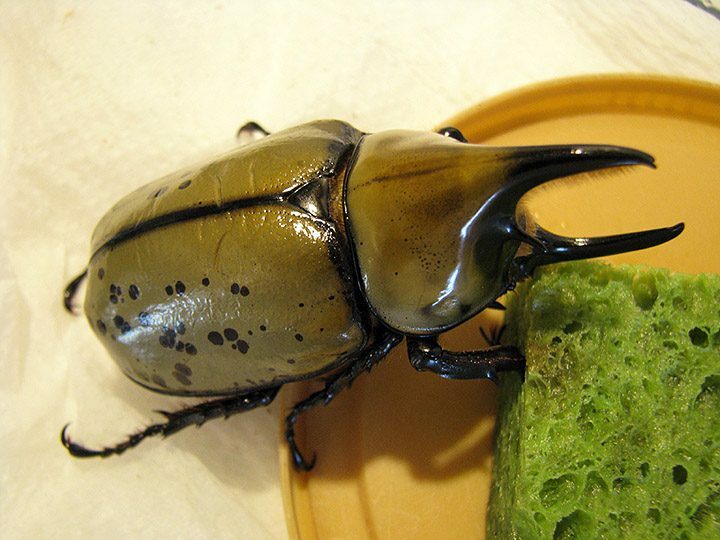 That's a beautiful beetle! Thanks for sharing the pics! Thank you for your post, great pictures! That is amazing that you have been raising D tityus for 16 years from one pair of adults! Great work! I have talked to more beetle breeders lately that are raising their Scarabs on 100% flake soil (sub made from fermented wood pellets). In the past, they have used a combination of flake soil and oak leaves but have found it not necessary to add oak leaves any more. Have you found this to be true as well? Do you add any protein supplements to get such big size or do you just use the fermented sawdust? How long does your D tityus stay in diapause before you are able to mate them? Sorry for so many questions but I raising the same beetle for 16 years is quite an accomplishment. Yes - I have been using only wood-based substrates for quite a few years now (either pure fermented sawdust, or blended 50/50 with naturally decayed wood flakes). Just fermented sawdust. I've never found the larvae of Dynastinae to take much of an interest in food supplements - all they seem to want is the substrate itself. I know that some hobbyists have been successful in getting the larvae of Dynastes, etc. to eat supplements, but it seems rather hit or miss, and more often than not, the larvae ignore the food, it spoils, and leads to fouling of the substrate and/or grain mite infestation. The trend these days seems to be to focus more on just using really good quality substrate, rather than food supplementation of larvae kept in lower quality substrates that may possibly be lacking in nutrition. 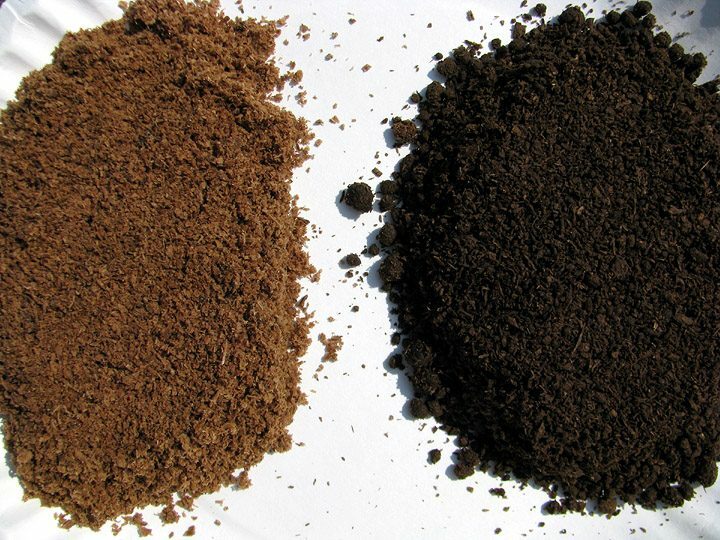 An advantage of fermented substrate is that it's made from raw sawdust - that is, sawdust that hasn't been sitting around on the forest floor for years, and therefore had much of its nutrient value leached out by the elements. You can't use raw sawdust for rearing larvae of course, but once fermented and adequately aged, it becomes a completely different kind of material, thanks to bacterial (primary) and fungal (secondary) action. That's hard to say, since I usually can't see into the cocoons and know exactly what developmental stage they're at. Undoubtedly though, following eclosion, they remain in their cocoons for perhaps 4-6 months. When they do emerge, they seem to be ready to mate immediately, although, I always wait at least a week before introducing a female to a male. I keep tityus continuously at an average temperature of between 70-77 F at all life stages. Having kept them under a controlled temperature for years, their breeding cycles have now become totally out of sync with the wild population, and it's not unusual for mine to emerge and breed right in the middle of winter. The seasons have now become meaningless to them, apparently. Thanks again. 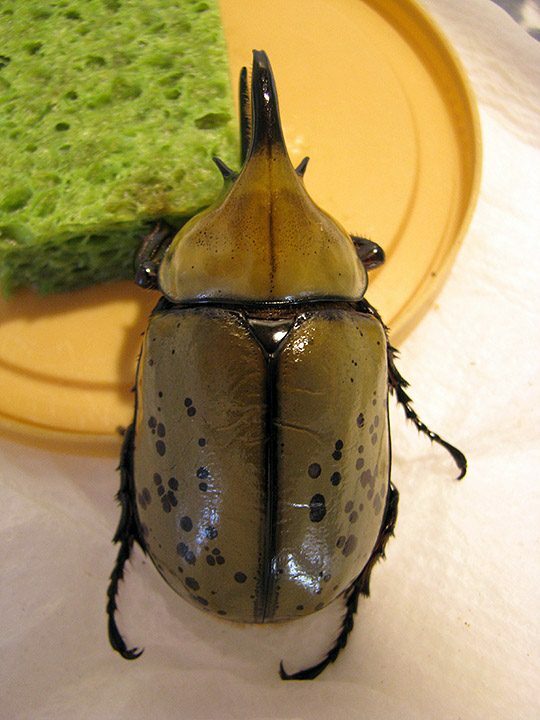 I have had D. tityus longer than any other species, although D. granti was the first rhino beetle I ever cultured, back around 1993, if I recall correctly. Presently, I am working with both species. Thank you Goliathus for your detailed explanations! Very interesting and helpful. Much appreciated. What other beetles are you currently breeding? I am now trying to convert my larvae to fermented sawdust only. In the past I have used a combination of fermented sawdust and oak leaves but it's much easier to just use the fermented sawdust. It's interesting that you mention a 50/50 blend of naturally decayed wood flakes and the fermented sawdust. I know another very experienced breeder who does the same. Unfortunately, I don't have access to naturally decayed wood. Do you feel that the naturally decayed wood offers a big benefit that the fermented sawdust does not? It's a very interesting topic that is not often discussed. most likely the naturally decayed wood has certain fungi and mold that the “artificially” decayed wood doesn’t. Apart from tityus and granti - M. punctulatus, M. sleeperi, Gymnetis caseyi, and Euphoria fulgida. Hoping to eventually have Gymnetina howdeni, Hologymnetis argenteola, and Euphoria monticola (all from southeastern AZ). One of the issues with leaves is that they decompose much more quickly than wood, and also, they more strongly attract fungus gnats. Oak leaves are useful for many Cetoniinae, however. Fermented wood is definitely the superior of the two, nutritionally speaking. I just tend to blend it half-and-half with my fermented material in order to keep from having to use quite so much fermented substrate, which is rather laborious to make (and also, takes quite some time to fully mature and be ready to use). I find that the 50/50 mixture produces the same growth results as using pure fermented substrate. Incidentally, it's very important that the fermented sawdust be completely "mature" before using it, otherwise it can actually be harmful to larvae. Once you start seeing fungal hyphae growing through it, that's a sure sign that it's settled out, and that fermentation is complete, with no risk of re-starting due to temperature / moisture changes. There are other ways of knowing of course, such as its odor (or even a lack of odor). Thank you again for sharing some great information. One of my favorite places to collect each summer is southern AZ. I plan to collect in the southeast areas like Miller Canyon, Copper Canyon and Carr Canyon. I know those species are the less common ones but if I come across them, I will get them for you. Last question, what do you mean by fungal hyphae growing? I find that knowing when the substrate is fully mature has always been a little confusing. I tend to go by the color (very dark or black), earthy smell or no odor at all, time (3 or more months) and the feel of the sawdust (very soft, no rough corners, sort of like wet newspaper) and then I put some in a large container with regular substrate and see if the larvae avoid it or do they eat it. I wish there was just an easy test that would give the results. Thanks - those would be great beetles to get into culture! I'm familiar with Miller and Carr canyons, though I don't think I've ever been to Copper Canyon. Last question, what do you mean by fungal hyphae growing? After the fermented substrate has been sitting for quite a while, I usually notice that it's been permeated by a lot of tiny white fungal threads. I've never had this happen with raw sawdust - it only seems to occur in substrate that's undergone total fermentation, and then been allowed to sit for at least several months after the fermentation process is completed. I find that knowing when the substrate is fully mature has always been a little confusing. I tend to go by the color (very dark or black), earthy smell or no odor at all, time (3 or more months) and the feel of the sawdust (very soft, no rough corners, sort of like wet newspaper) and then I put some in a large container with regular substrate and see if the larvae avoid it or do they eat it. I wish there was just an easy test that would give the results. The mere passage of time usually ensures that the substrate will be safe to use. I tend to let mine sit for at least 4 to 6 months before using it, although, I know it's safe to use prior to that. 3 months is usually adequate, especially if the preceding weather has been reasonably warm. I always do fermentation from mid-June to mid-Aug, when the weather is at its warmest. That way, my batches of fermented substrate can undergo much of the final maturation while the temperature is still rather warm, over Sept - Oct. My process takes around 4 or 5 weeks for the actual fermentation stage, then this is followed by a minimum period of at least three months (preferably longer) in which it sits in a well-ventilated plastic trash can so that it can fully mature. By that point, the sawdust has gone from light tan to very dark brown (photo attached). So, yes - the color is definitely a reliable indicator. Thank you again for all the great information. I'm sure this is extremely helpful for the entire hobby. Great photo showing the contrasting colors. I think I know what you mean regarding the fungal threads. I have occasionally seen that develop in my containers and I will usually then resterilize the substrate to kill off the fungi because I thought it would not be good for the larvae. Copper Canyon is near Montezuma pass on Montezuma Canyon Rd. A great place for collecting all types of beetles. I'll keep a lookout for those species. Those are some amazing looking scarabs. Thanks again and please keep us updated with photos of your other larvae. I'm really not sure what to think about the presence of fungi in beetle substrate - I myself don't think I've ever seen any evidence of it being harmful. It's universally present in any decaying wood that larvae would inhabit in the wild, and indeed, the wood wouldn't be decaying at all unless the fungus was present, and if not decayed, it wouldn't suitable as food for the larvae. So, I have to assume that beetle larvae that feed on rotten wood are immune to any defensive substances the fungi might possibly produce. While some fungi may be toxic to us if ingested, surely, any animal that lives in (and actually feeds on) wood that's been colonized by fungi must be completely adapted to it? Incidentally, the defensive substances produced by fungal hyphae are probably directed primarily at deterring the growth of other fungi, in order to help keep them from gaining a foothold on wood that the initial colonizer has claimed.